This plan's wide front porch says welcome home, and inside, its comfortable design encourages relaxation. A center dormer lights the foyer, as columns punctuate the entry to the dining room and great room. The spacious kitchen has an angled countertop and is open to the breakfast bay. A roomy utility area is nearby. Tray ceilings add elegance to the dining room and master bedroom. 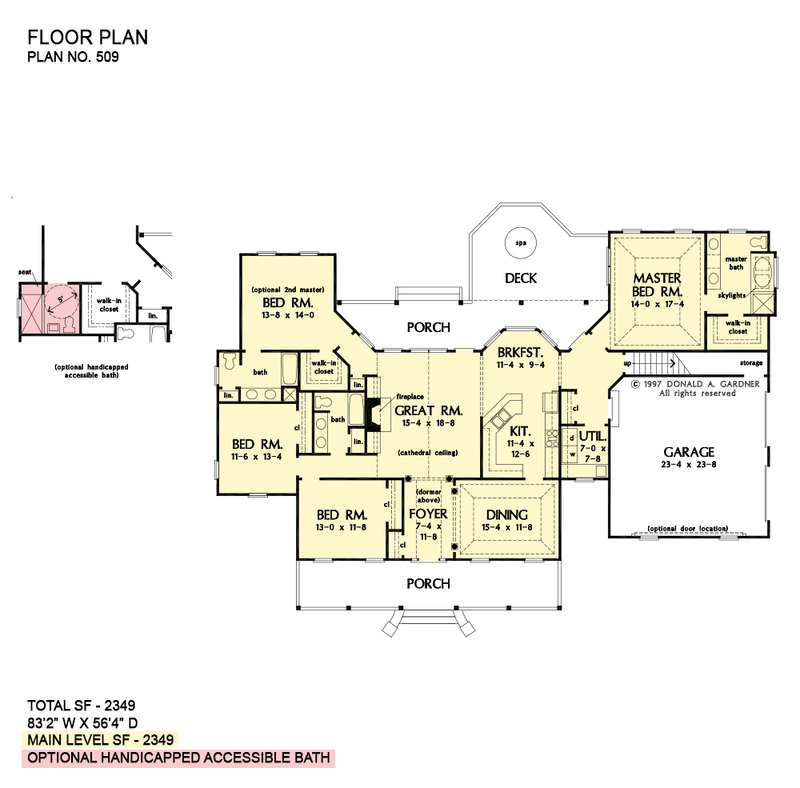 A second master suite is located opposite and features an optional arrangement for wheelchair accessibility. Two additional bedrooms share a third full bath with linen closet. 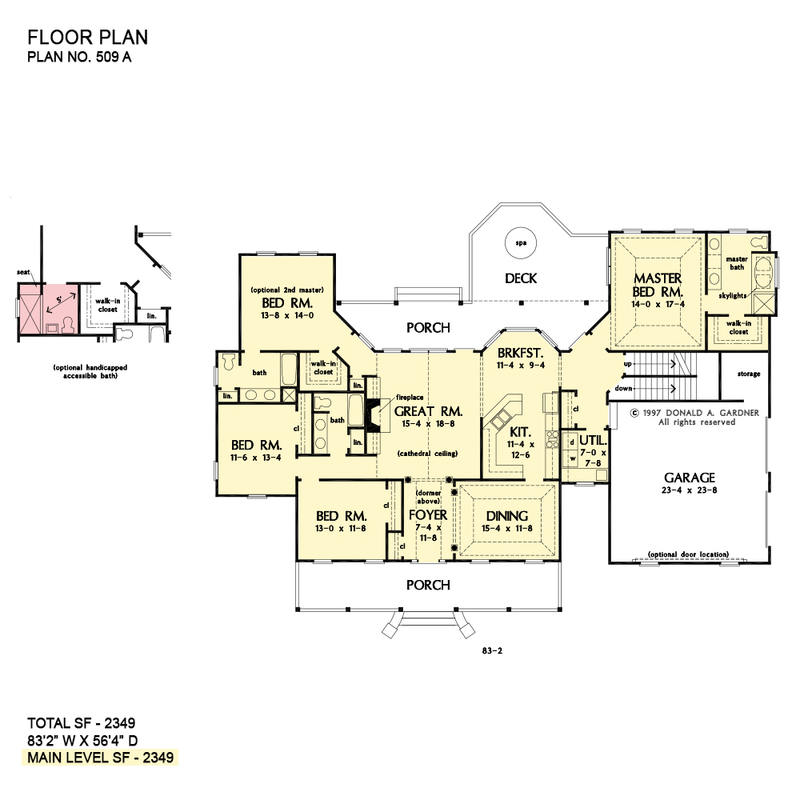 1st Floor: 2349 Sq. Ft. 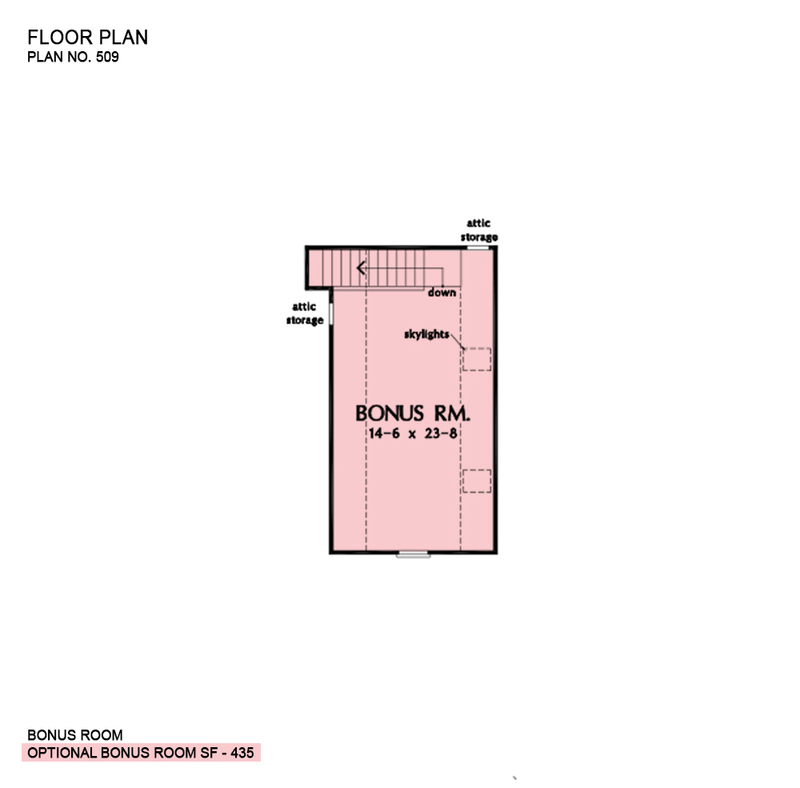 Bonus Room: 435 Sq. Ft.
House Dimensions: 83' 2" x 56' 4"
Foyer (Vaulted): 7' 4" x 11' 8" x 19' 0"
Dining Room (Tray): 15' 4" x 11' 8" x 11' 0"
Great Room (Cathedral): 15' 4" x 18' 8" x 18' 8"
Bonus Room (Vaulted): 14' 6" x 23' 8" x 8' 0"
Master Bedroom (Tray): 14' 0" x 17' 4" x 12' 0"
Bedroom #2 : 13' 0" x 11' 8" x 9' 0"
Bedroom #4 : 13' 8" x 14' 0" x 9' 0"
Porch - Front : 39' 4" x 7' 4" x 0' 0"
Deck / Patio : 20' 8" x 9' 11" x 0' 0"